The 120W O&GK includes everything but the pole. Enclosure and panel(s) easily mount to a schedule 40 pole for quick setup. The 120W O&GK’s rugged aluminum enclosure houses an industry leading Morningstar SunSaver charge controller and a durable MK battery. 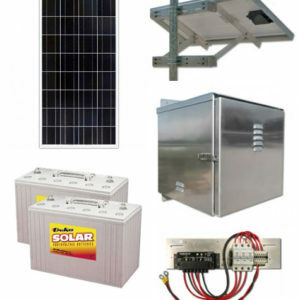 Coupled with our anodized aluminum C1D2 Ameresco Solar module frame and our proven success of integrating quality components that work seamlessly, you can expect reliable service from our kits.